As someone who was actively involved in the arts as a teen, including marching band, the Indianapolis Children’s Choir and many stage productions, designing for the performing arts is a passion of mine and has been a highlight in my architecture career. But as school districts face more and more financial constraints, the arts is often one of the first things to be trimmed in the budget. Indeed, many penny-wise but pound-foolish observers are even asking if having a large central auditorium is still relevant in today’s high schools. I respond with an emphatic YES. With new design concepts and an emphasis on adaptability of space, it’s still possible to have a place where music, plays and other performance arts can truly have a home in the modern high school. Theaters are an important building type with a history that goes back thousands of years, to the ancient Roman and Greek times and beyond. They were places where people could gather to see and be seen, where distractions were blocked out and the community could focus on what someone had to say, whether through speech or performance. With a key tenet of 21st century learning focusing on educating the whole student, these spaces are still relevant today in developing communication and presentation skills, creativity and a passion for learning. To support these concepts, it is important to provide a performance atmosphere for arts and music education that can’t be done in any other type of space. You wouldn’t try to hold a football game in an indoor gymnasium, or a science fair on a soccer field. The same goes for music, dance and acting—they can’t be presented in any other space without reducing their impact. The challenge is incorporating a performing arts space in a way that aligns with the 21st century emphasis on flexibility, where places within the school can be used for more than one purpose. People tend to think of an auditorium as being rigid—a place that’s empty most of the time, and requires a technical staff to properly run the lights, audio, curtains, etc. But at Fanning Howey, we design performing arts auditoriums that can be used easily for multiple purposes. By making key adaptations to the technology, the space can be made easy to use by non-technical people. So, for example, a teacher could turn the auditorium into a lecture space or a movie theater with the touch of a button. Multi-purpose auditoriums can easily be turned into a lecture space or movie theater. Some of our auditoriums are flexible even in terms of size. These spaces can be easily expanded into an adjacent cafeteria or gymnasium area for overflow seating. We even consult with local professional arts organizations and speaking groups to interest them in using the space in order to connect to the community. Students in trade classes are also brought in to help build sets and learn additional crafts. By maximizing the number of uses an auditorium can be put to, it opens up more possibilities and makes the design more justifiable financially. 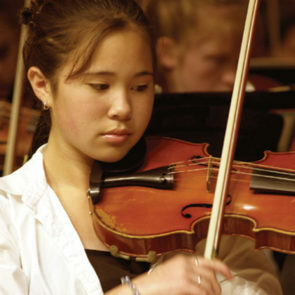 The arts are an important and necessary part of a well-rounded education. 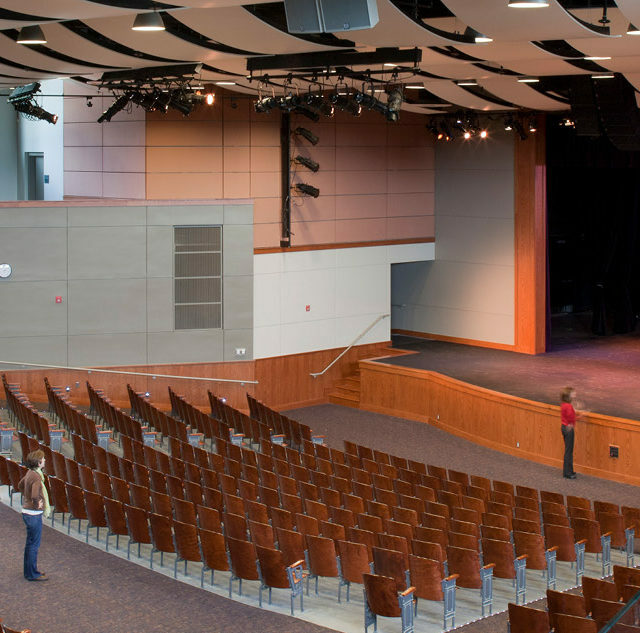 With a little innovative thought and creative design, the modern high school auditorium can serve as the foundation for learning about the arts in your community, while performing as a flexible and essential component of the school.